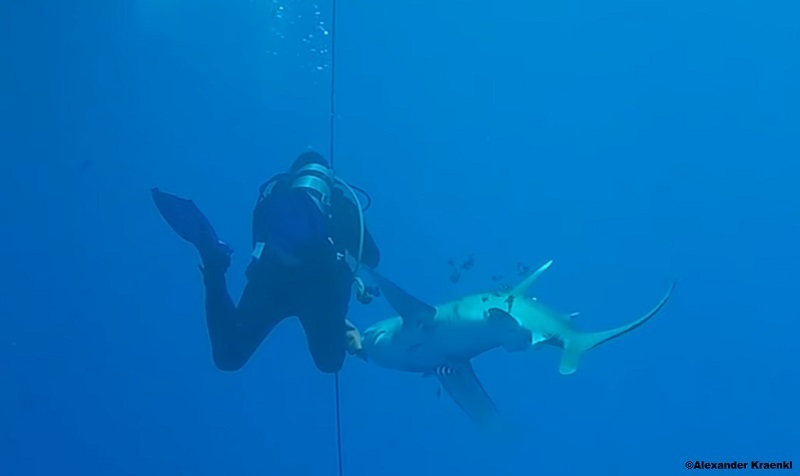 Two videos have been shared showing the moment sharks attack divers in Egypt. Both divers were bitten while off Brothers Island in the Red Sea. The islands have about 12 possible dives sites where divers can encounter a variety of shark species including the oceanic whitetip, grey reef, hammerheads and silvertip sharks. Alexander Kraenkl was scuba diving the site June 2018, when he had an encounter with an oceanic whitetip shark. “It was very close, which is absolutely unusual. Something like a shark, a whitetip shark which is called Longimanus… so close to us,” Kraenkl said. As he swam towards the anchor rope, he turned his back on the shark which was following him. “I’ve been concentrated and looking forward. In that moment I grab the rope, something happened,” he said. The shark grabbed Kraenkl’s right thigh near a safety item hanging from his dive vest. He felt the shock of the bite and looked down to see the shark as it swam away. He then noticed the blood coming from his leg and headed back to the boat. His son and other divers were pulled form the water as Kranekl was given first aid on the boat. The captain radioed for assistance and located a doctor aboard another vessel. The doctor was carried by a small boat to Kraenkl and began treating the patient. Kraenkl was given vodka while the doctor stitched up the deep lacerations. The Austrian has no qualms about entering the water again and has already booked another trip for next year. A second more serious shark attack occurred around 11:30 a.m. Nov. 3. An unidentified diver was in the water with around 20 scuba divers off the islands when a whitetip shark showed up. The shark circled the various divers who were scattered in the water last week. As the shark circles, it takes a keen interest in a diver who it approached multiple times only to be pushed away. After the third rebuff, the shark swam towards a diver carrying side mounted tanks. Once the shark passes the diver, it grabs hold of the unsuspecting man’s calf and appears to do a 360 with the man’s leg in its teeth. He goes on to identify the man who was bitten as a German citizen whose calf was severed. The patient was stabilized and eventually flown back to his home country. While Egypt is a beautiful dive destination there have been complaints of boats dropping waste, which can attract feeding sharks, in the water. Earlier this year a tourist was killed Aug. 3 by a shark off Marsa Lam Beach. Around 3 p.m. Petr Blesk jumped off a pier leading to deep water from the Calimera Habiba beach. The 42-year-old swam a short distance when he turned and began swimming rapidly back towards the pier. His wife saw a large shadow in the water and her husband disappeared. A few seconds later, the tail of the shark broke the surface. Blesk’s remains later washed ashore. Almost a year to the date of the Blesk incident, an Austrian was bitten on the hip. Christine Schachinger was snorkeling, Aug. 5, 2017, in the same general area when a whitetip was spotted. The water was quickly cleared, but as Schachinger was exiting the water, the shark grabbed her right side just above the hip. There have been a total of 92 shark attack bites (67 with injury, 19 of which are considered provoked*) publicly reported and verified in 2018. Five fatal**; 33 were reported in the U.S (including one fatal), with 13 occurring in Florida and 3 in Hawaii. Twenty-two have been reported in Australia, one fatal. Eight unconfirmed bites, worldwide, not included in the total count.